Paul Fleischman, psychiatrist, author and long-time meditator, writes about the psychology, wisdom and poetry of those who have inspired him in his personal quest for harmony and happiness. The learnable qualities of peaceful living are brought into focus by examining the lives of diverse exemplars such as Mahatma Gandhi, Walt Whitman, Henry David Thoreau, the Buddha, John Muir, Scott and Helen Nearing, and Rabindranath Tagore. His ultimate example is an autobiographical account of his own experience with his practice of Vipassana. The final chapter of the book is a compelling appeal to all people to walk the path of peace as a way of healing the earth itself. This new paperback edition includes a new introduction and a foreword by Professor William Radice, noted Tagore scholar and poet. "We do not create inner peace. We discover it. It is in fact present and available," writes the author. Also available in eBook formats. Every sentence is remarkably thought-filled. Peace is Selective on page 63 is so sweet! In this book, psychiatrist Paul Fleischman writes poetically and poignantly about this lure which is a spiritual practice, a determined way of life, and a lifelong quest. "Starting from many different courtyards and doorsteps, it always converges on purity of heart, horizonless perspective and service to the common cause." 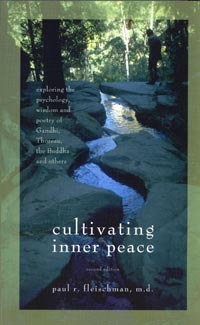 In order to delineate the multiple meanings of inner peace, the author looks at the lives of people who pursued it with dedication, creativity, imagination, discipline, and devotion. He finds hints of peace as a dynamic force in the simple lifestyle of the Shakers and in the organic gardening of Scott and Helen Nearing. Walt Whitman's ecstatic poetry and Mahatma Gandhi's inner cultivation of peace are two more examples. John Muir and Henry David Thoreau are heralded for their discoveries of peace in the natural world. Father Daniel Berrigan shows us the prophetic dimensions of peace as a way of life, and the Indian poet Rabindranath Tagore demonstrates a life of peace in action. While many psychological tracts have cheapened the ideal of inner peace, Paul Fleischman enables us to see it afresh as "a natural phenomenon, a sweet memory, and a provocative force."